Broadcast on Thursday 30th August 2018. It was a delight to have Joseph Wooltorton back in the studio after his break. 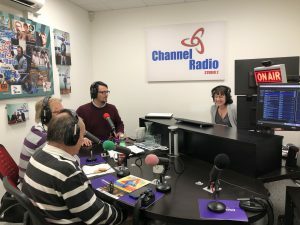 Our studio guests were Peter Kingham and Paul Dashwood, part of the organising committee for the Edenbridge Motor Show & Music Festival, organised by the Eden Valley Chamber of Commerce. The big event is taking place on Sunday 9th September and thousands are expected to attend. Listen to the show to hear about the attractions on the motor side and also the headliners to the music festival. The Community Radio Show is also delighted to announce that it’s very own Laura Lawrence will be MC at the event and she’s looking forward to seeing you there! To find out more, book your classic car/motorbike or any other details about the event, visit: www.edenbridgemotorshow.co.uk.